DxO Labs have just released version 5 of DxO Analyzer. 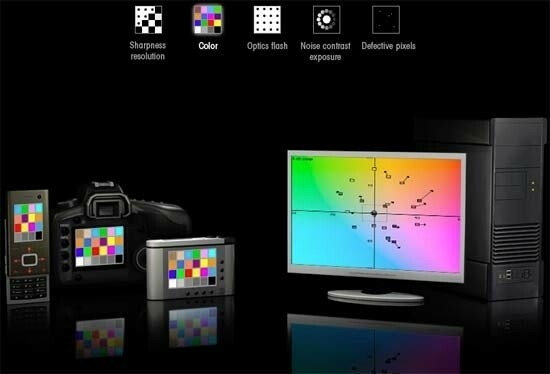 Billed as an extensive measurement solution that provides in-depth raw and RGB image quality analysis for any image capture device, whether still- or video-capable, DxO Analyzer v5 offers new video image quality testing features such as motion artefact and image stabilisation system measurements that enable DxO Labs to report extensive video quality test results on dxomark.com. October 18, 2012 - DxO Labs announces the immediate availability of version 5 of DxO Analyzer, its renowned solution for measuring the image quality of any image capture device, to bring the most advanced video image quality testing capabilities to its DxOMark data factory. Such image quality test results data are also powering camera, lens, and mobile reviews of major press partners such as Digital Photography Review, the world’s #1 photography website. DxO Analyzer v5 is an extensive measurement solution that provides in-depth RAW and RGB image quality analysis for any image capture device, whether still- or video-capable, and that offers a range of solutions for reliably evaluating, diagnosing, and fine-tuning digital camera products and prototypes. DxO Analyzer solution includes rigorous measurement protocols to ensure that test results are accurate, repeatable and consistent over time and that image quality measurements for a broad range of digital cameras (from DSRLs to DSCs and mobile phone cameras) can be fairly compared. DxO Analyzer solution is tailored to cope with the reliability and productivity requirements of its worldwide testing operation that produces the data in DxO Labs? now-famous online image quality database, www.dxomark.com. Thanks to DxO Analyzer v5’s new video image quality testing features such as motion artifact and image stabilization system measurements, DxO Labs will now be reporting extensive video quality test results on dxomark.com to help consumers better understand DSC performance. DxO Analyzer v5 features a unique packaged solution that integrates a high-precision 6-axis vibrating hexapod to provide realistic and repeatable simulation of natural hand-shaking -an essential feature for testing video and still image stabilization technologies now embedded in most digital cameras and mobile phones. DxO Analyzer v5’s advanced image processing technologies deliver the first automated characterization of distortions produced by Electronic Rolling Shutters featured by most CMOS sensors. Designing and manufacturing 3D camera modules presents mechanical challenges. DxO Analyzer v5 offers the first commercial solution for accurate 3D camera pose measurement. The solution addresses both video and still cameras. DxO Analyzer solution is tailored to cope with the reliability and productivity requirements of its worldwide testing operation that produces the data in DxO Labs’ now-famous online image quality database, www.dxomark.com. ERS artifact: the propeller breaks! DxO Analyzer v5’s advanced image processing technologies deliver the first automated characterization of distortions produced by Electronic Rolling Shutters featured by most CMOS sensors.